Remember: In order for the Divi Business Pro child theme to work, you must have Divi from Elegant Themes. If you do not have it you can purchase it here. Once you have it, please install it on your self-hosted WordPress website. Please upload the Divi Business Pro Child Theme to you your self-hosted WordPress website. Make sure the Divi theme is already installed and activated. 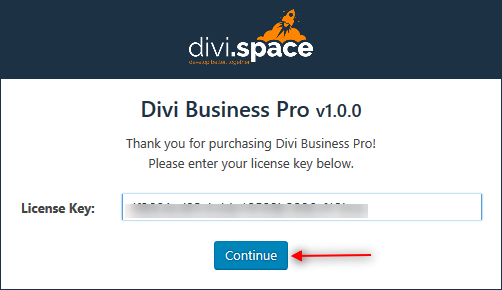 After you have activated the child theme, click on the 'Divi business pro' menu item on your left panel and enter your license key in the input field provided in the dialogue box that pops up; then click 'Continue'. For the next step, click on the 'Divi Business Pro' menu item on the left panel. From the WordPress Dashboard go to the newly added tab bearing the name of your "Divi Business Pro" child theme on the left admin panel. Under that menu, please click on ‘Import Demo Data’ and then follow the instructions provided on the page. Please be patient while the demo data of the Divi Business Pro child theme is imported into your site. Move to the settings area in your left Admin panel. Click ‘ Reading’, under ‘Your homepage displays’ select ‘A static page’ and for the Homepage drop-down menu select either ‘Homepage 1’ or ‘Homepage 2’. While you are in the ‘Reading’ settings, under ‘Posts page’ select ‘Blog’. Remember to Save Changes before moving on to the next step. Move back to the ‘ Appearance’ tab in your left Admin Panel and select ‘menus’. You should select the 'Main Menu' from the top drop-down and in the bottom checkboxes make sure to tick 'Primary Menu'; then click the 'Save' button. While still on the Menus page, select the 'Secondary Menu' from the top drop-down and in the bottom checkboxes make sure to tick 'Secondary Menu'; then click the 'Save' button. Move back to the ‘ Appearance’ tab in your left Admin Panel and select ‘Widgets’. Open the Footer Area #2 sidebar and then the Navigation Menu Widget; from the Select Menu drop-down choose 'Footer Widget Menu'; then click the 'Save' button.